Cut glass and lead crystal glass are not the same thing. There are traces of lead in all glass but, in order for the product to be called "crystal" in the United States, the glass must contain at least one percent lead. In Europe, glass containing four percent lead may be classified as crystal. Czech crystal must contain at least 10 percent lead. Full-lead crystal contains between 24 percent and 32 percent lead. Lead is added to glass to make it easier to cut with accuracy. 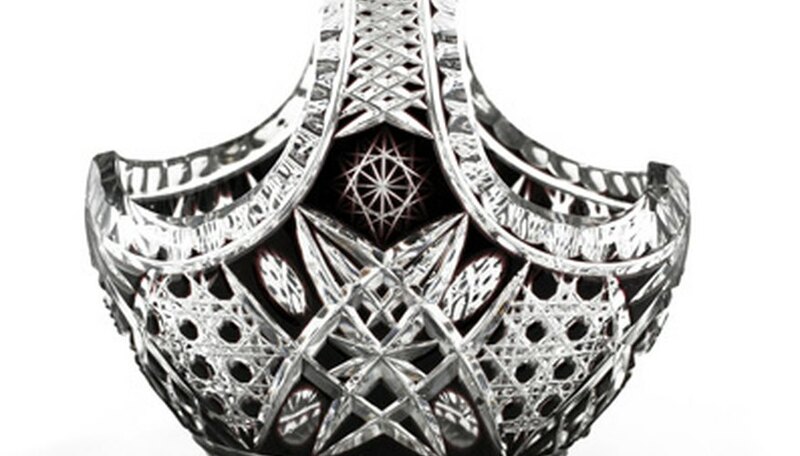 Intricate designs can be cut into lead crystal that cannot be cut into ordinary glass. The higher the amount of lead in the compound, the greater the detail possible. Some crystals may contain less than the 24 percent full-lead content mandated by European law but a similar effect may be achieved if the crystal contains barium. Lead and barium both enhance optical quality. Both cut glass and lead crystal glass can be heavy. Cut glass gets its weight from a heavier volume of glass that makes the end product quite thick. Lead crystal glass is thinner in profile but just as heavy or heavier than cut glass because of its high lead content. Cut glass can be given attractive designs or angles known as facets to increase its light refraction quality. However, the quality is inferior when compared to the light reflecting and bending through full-leaded crystal. Holding each type of glass up to the light is the best way to discern optical quality. Full-leaded crystal, at 24 to 32 percent lead content, has a slightly gray cast to it that enhances the highlights in the facets. Place a cut glass article next to a similarly cut item of lead crystal glass. Shine a light through both items simultaneously. The lead crystal glass will appear clearer and seem to sparkle more. The lead content will result in a multi-rainbow effect, as if looking into several prisms at the same time. Light will shine through and reflect back from the facets of the cut glass but the refractive rainbow effect will be far less dramatic. When tapped carefully with the edge of a fork or "pinged" with a flick of the fingernail, lead crystal emits a characteristic ringing sound that cut glass cannot produce. The crystal ring lasts several seconds, while glass produces a less satisfying "plunk" sound. Lead crystal can even be made to "sing." Try moistening your index finger and tracing it around and around the rim of a lead crystal wineglass. A lasting, clear, high tone will resonate as long as the rotating motion continues and the rim remains slightly wet. The higher the lead content in the glass (up to a maximum of 32 percent), the more the lead crystal glass is worth. Side-by-side comparison and the use of light and sound tests will ensure that you get what you pay for.